We are so very grateful for the enthusiasm and interest that people have shown regarding 2018 ADHD Awareness Month as we work to Set the Record Straight. Armed with recent information about ADHD and research-supported practices, life can be better for you and those you know with ADHD. We thank all who have visited our website and shared the information, voted for their favorite contest entries, gone to our Facebook page, signed up to our mailing list, as well as those who submitted informative, funny and heartfelt videos, memes, stories and art. Thanks, too, go to our judges, Alan Brown of ADD Crusher and Rick Green of TotallyADD, as well as our other sponsors: Akili Interactive, and Shire Pharmaceuticals. Check out the videos and see who won! Enjoy the memes and find out the winners!. Register for the 2018 Annual International Conference on ADHD to be held November 8 – 11, 2018 in St. Louis, MO. Before you go, take a few minutes to check out our resources. 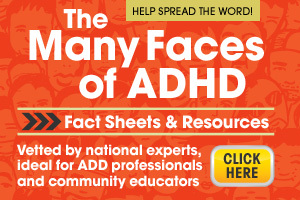 And click on any of the logos at the bottom of this page and you’ll have access to some of the best information and help for ADHD that you’ll find on the web. And sign up for our Mailing List to join the movement! We’ll keep you posted on updates.